National debates about historic, sometimes controversial, art on college campuses are opening conversations at The University of New Mexico. The focal point? ‘The Three People’s Murals’ in the historic west wing of Zimmerman Library on UNM’s Main Campus. Historically, public art has been a medium for the expression of controversy, progression and protest – often blurring the lines between acceptability and provocation. The struggles of the past, becomes the art of the present – leaving interpretation up to those who neither witnessed the original inspiration, nor will ever be able to fully understand the artists’ intent. The artist of the Zimmerman murals, Kenneth Adams (1897–1966), was born and educated in Topeka, Kan., and studied art at the Art Institute of Chicago. 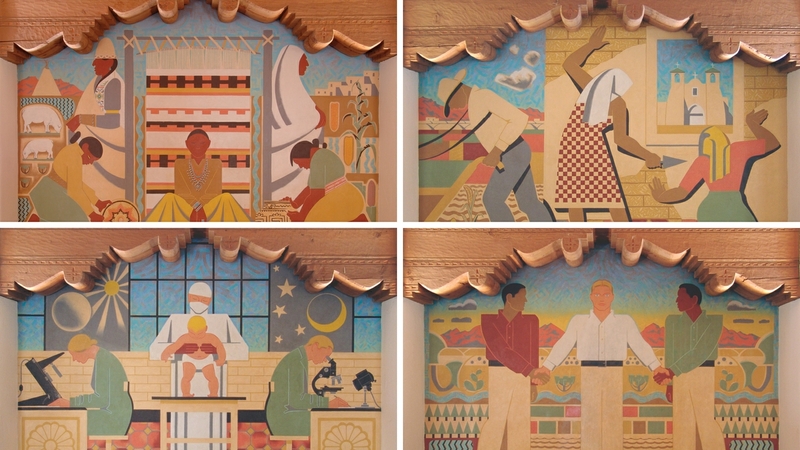 According to experts at the Center for Southwest Research & Special Collections, the subjects of Adams’ four oil-on-canvas murals match the modernized Spanish pueblo style of the Zimmerman Library building. The murals depict the three prominent traditional peoples of New Mexico — Native American, Spanish and Anglo. According to historical records, each of the murals shows an interpretation of traditional peoples’ contributions to local culture and are combined with a feeling of modernity to portray a look toward the future. Since its creation in 1939, the mural series has woven rich and controversial contributions into the tapestry of UNM — which is the basis for a new class encouraging students to assess campus art through a lens of higher education and history. The mural has been the subject of community protest, from the time it was first constructed to the present, and this class aims to create a robust, constructive conversation about nuances between artistic expression, freedom of speech, cultural sensitivities and how to appropriately address unacceptable content. The upcoming ‘Community Arts Practice: The Zimmerman Library Murals In & Out of Contexts’ class is being offered for the first time in Spring 2018. It’s establishing a model to be potentially used at larger universities like Indiana University, University of Minnesota, University of Michigan and Notre Dame University, where similar discussions about public art and campus climate are already taking place. 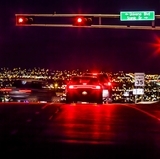 UNM is using an interdisciplinary model to explore issues surrounding art in public places. The course spans several departments including Anthropology, Fine Art, American Studies, Native American Studies and Museum Studies. Lecturers are from these areas will also be joined with educators from psychology, political science, Chicano/a Studies and historic preservation. Students will assess critical issues related to the impact of public art on communities through discussion, research, collaboration and problem-solving. They will consider what responsibility public art holds to its audiences, and how it relates to free speech, race and social justice. 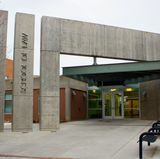 The class will use the information gathered and topics discussed to generate options for the future of the Zimmerman murals, which will be presented to the university president. Guest speakers and faculty from across campus will participate, and members of the community are encouraged to get involved. 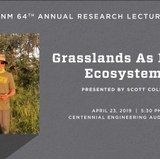 Several of the lectures will be open to the public, with the hope that by educating one another, the campus community and the wider Albuquerque area can create a deeper sense of unity, understanding and appreciation for diversity. “This class is centered around the idea that you can’t change the past but you can change history and that history is a living thing that we - especially our students - can talk to,” Pinder said. To read more about the class, and view its schedule, click here.